Ms.Renuka Upreti, President of The Women’s Foundation of Nepal, was conferred with Prabal Jana Sewa Shree medal by Rt. Honourable President of the Federal Democratic Republic of Nepal, Mrs.Bidya Devi Bhandari. 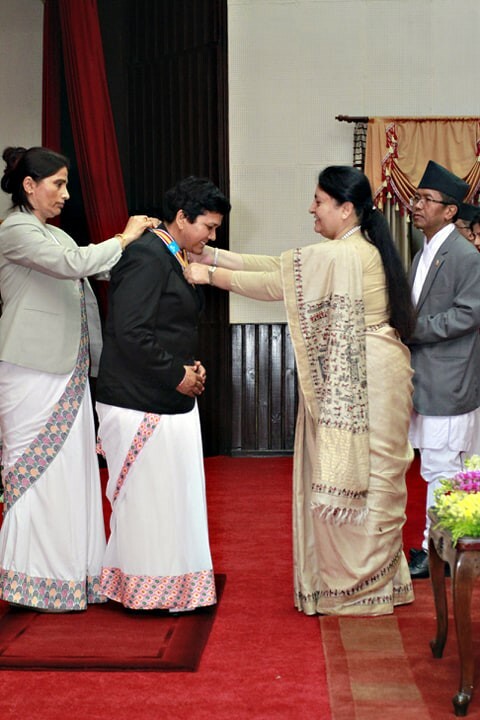 The award was conferred in recognition for her exemplary contributions to the nation of Nepal. The honour was awarded in the presence of Nepal’s Vice-President, Prime Minister, Speaker of the House, Chairperson of the National Assembly, Deputy-Prime Minister, Ministers, Chief of the Constitutional Bodies and other VIPs. It is one of the highest civilian awards of Nepal. It is awarded to personalities from different walks of life in recognition of their contribution to the country. The announcement was made on Constitution Day last year. The award was presented at a special ceremony organised by the Ministry of Home Affairs at the Office of the President, Sheetal Niwas. 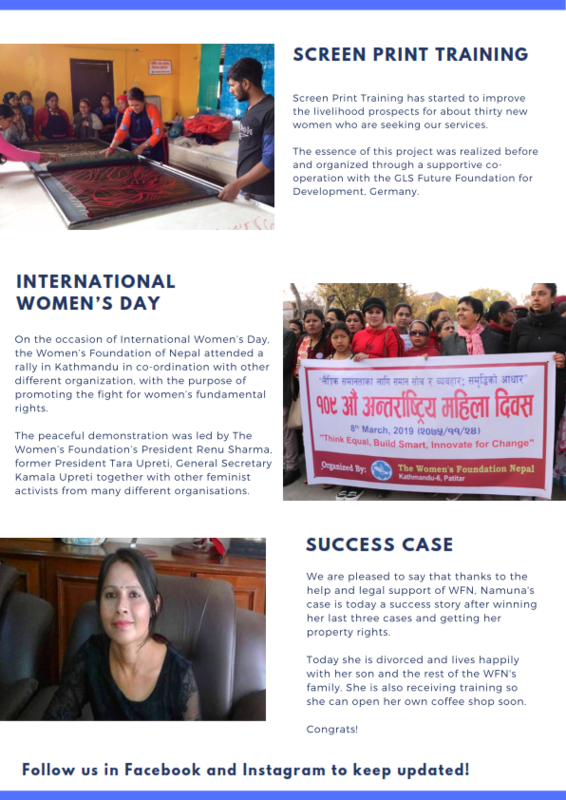 On the occasion of International Women’s Day, the Women’s Foundation of Nepal attended to a rally in Kathmandu in co-ordination with other different organization, with the purpose of visualizing the fight for women’s fundamental rights. 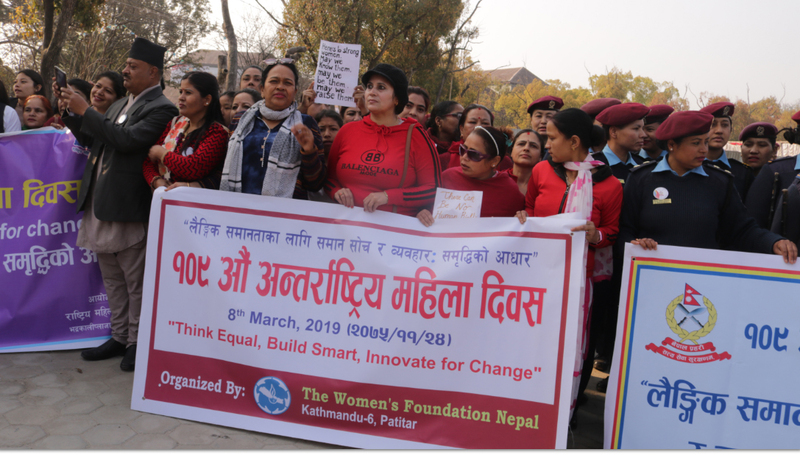 The peaceful demonstration took place at Ratna Park, Bhrikuti mandap and was leaded by Women’s Foundation president Renu Sharma, former President Tara Upreti, General Secretary Kamala Upreti together with other feminist activists from different areas and collectives. 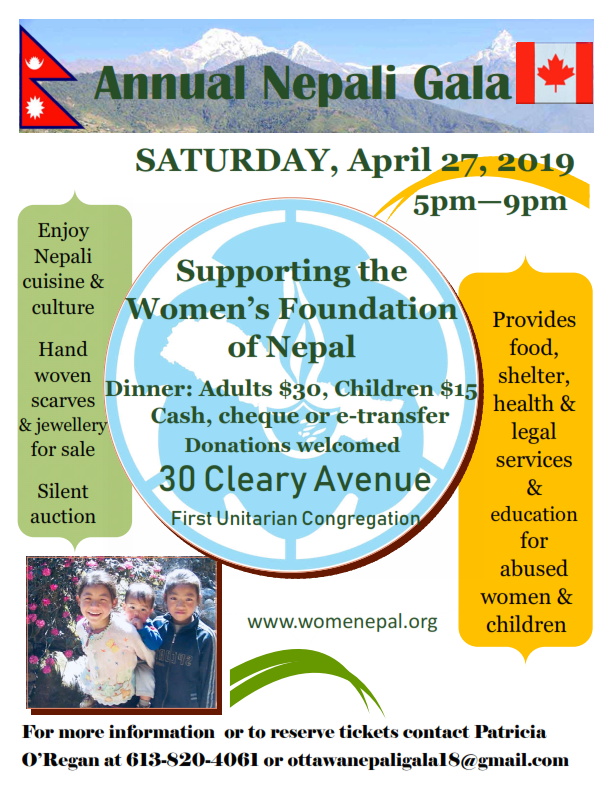 During the event, big banners with clear demands could be seen, making special emphasis on women empowerment, gender equality and on how efforts must be joined in order to have a real impact on Nepalese women’s life. Likewise, girls from different ages showed slogans that called to stop all kind of violence towards women and protested for a more equal society in which men and women have the same opportunities. 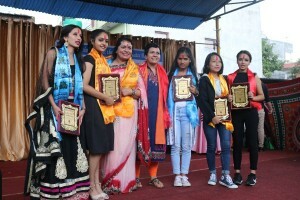 After the demonstration, a formal act was held at the City Hall with the attendance of the President of Nepal Honorable Mrs. Bidhya Devi Bhandari and other authorities.. The events held last Friday in Kathmandu were the evidence that Nepal moves step by step towards an inevitably more equal society. However, big changes remain to be done and from women’s organizations we will keep fighting towards this goal in order to inspire our local environment and to achieve a real improvement for the future generations. 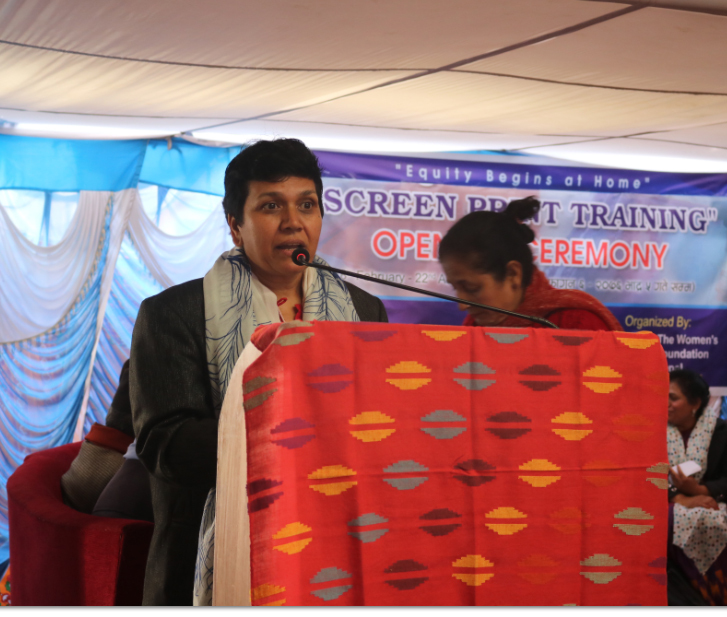 Screen Print Training has been started to build lasting solution to poverty and unemployment by securing economic sustainability for Nepalese women. Secondly, this training will make them independent and self-sustained to make their future better. The key of success of this project is to develop a new generation of women with better opportunity for sustaining their life. We focused this program for the long-term needs for obtaining economic empowerment, so that women can provide for themselves and their families. Additionally, the program will impart knowledge and skill on screen printing technology so that the beneficiaries could be able to earn for their better livelihood in the coming days. We are pleased to share that the distinguished guest Dr. Annette Massmann to honor us with her presence. We would like to thank our special guests Vanessa , Ursula , and Monika. Special Thanks to Former President of WFN Tara Upreti, President of WFN Renu Sharma, General Secretary Kamala Upreti, Devendra Parajuli, Program Supervisor WFN. Moreover, we would like to extend our heartfelt thanks for all who have directly and indirectly contributed for the success of program. Many people, both local and international, attended the ceremony and enjoyed the many speakers who emphasized the importance of women’s education and opportunities in our society. We are happy to be able to contribute to this important cause. Through this screen print school, we aim to provide an arena where women can gain skills and new knowledge that may benefit their job opportunities in the future. 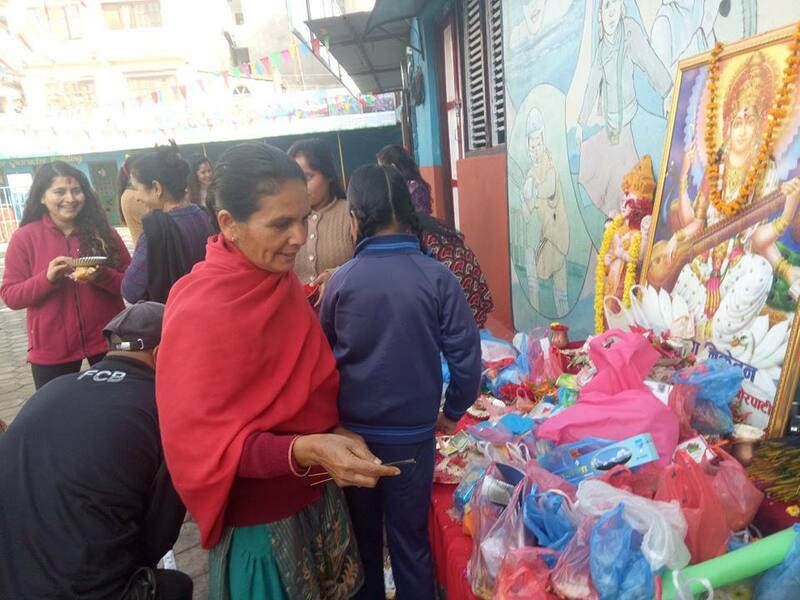 News: On 24th August 2018, the women’s Foundation Nepal had the immense pleasure of releasing a booklet named “Kanuni Sandesh Pustika (Legal Information Booklet)” and distributing Stickers and hand bags following the amended laws that helped push through for the rights of women and children in Nepal. The standout changes are that for the first time ever, children can now get citizenship through their mothers too. This is life changing for many individuals whose fathers were absent and hence, could not receive a citizenship. Also, there are now equal inheritance rights for women and men, and stronger punishment for domestic violence, witch hunting and human trafficking. The program was focused on information dissemination and sharing with the Local Representatives and specially focused on Deputy Mayors who have the rights to implement and amend the legal provision justly for the women and children in their concerned metropolitan cities, municipalities and rural municipalities. 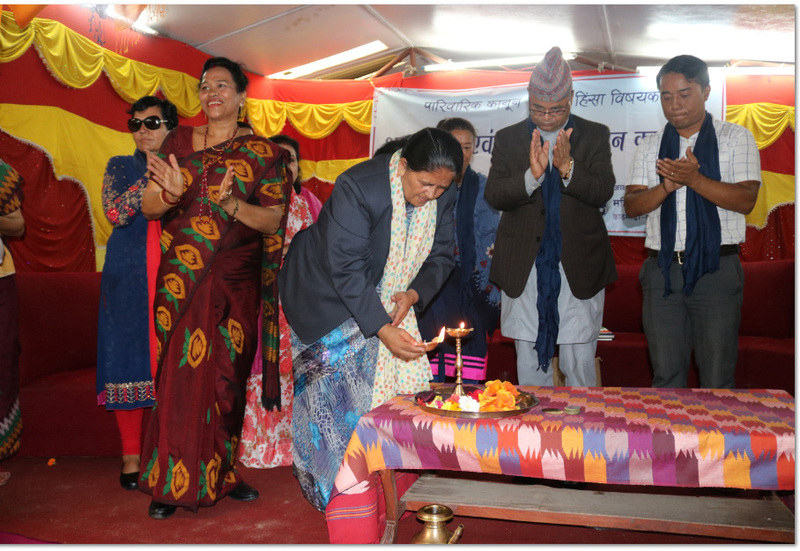 The chief guest of the program was Ms. Sashikala Dahal, Vice-chair of the National Assembly and followed by the special guests Mr. Rameshwor Phuyal, Provincial Assembly member and Mr.Chiring Dorze, Provincial Assembly member. 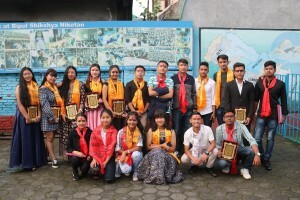 The program has many guests as deputy Mayors from Kathmandu, Patan and Bhaktapur districts along with Human Right Activists, Women and Children Activists and Media Personalities. Also, two papers were presented during the program by Prof. Dr. Sashi Adhikari on “New Family Legal Provision including Marriage, Divorce, Property Rights and more” and Advocate Mr. Saroj Nepal on “Domestic Violence Law”. The book release, as well as the law changes it celebrates, mark an important time in the history of Nepal, where misogynistic laws are broken down. Women’s voices are heard and empowered in society, and the great reception of our event makes us proud to fight for women’s rights in Nepal. Still there are many legal provisions that should be amended and the local representatives makes commitment to work for the implementation of just rights for women and children during the program. Also, they promised to discuss the issue in their assembly meeting for the amendment of the new legal provisions that is needed to be amended. We hope the hurdles would be eliminated in the future. We would like to thank ADHARA Foundation Family, different organizations and all the participants from different nook of the country for making a program successful. Outstanding 10th Grade SEE Graduation – Congratulations to all! The school Bipul Shikshya Niketan organised a farewell program for the SEE (secondary education examination) graduation, and we are delighted that our children living in the shelter home have graduated with flying colors. Their hard work shows in their grades, and we are sure that their further studies will be successful. The students have left the school and enrolled in a college for grade 11. The WFN wishes them all the best for their future, and congratulations to all the graduates! 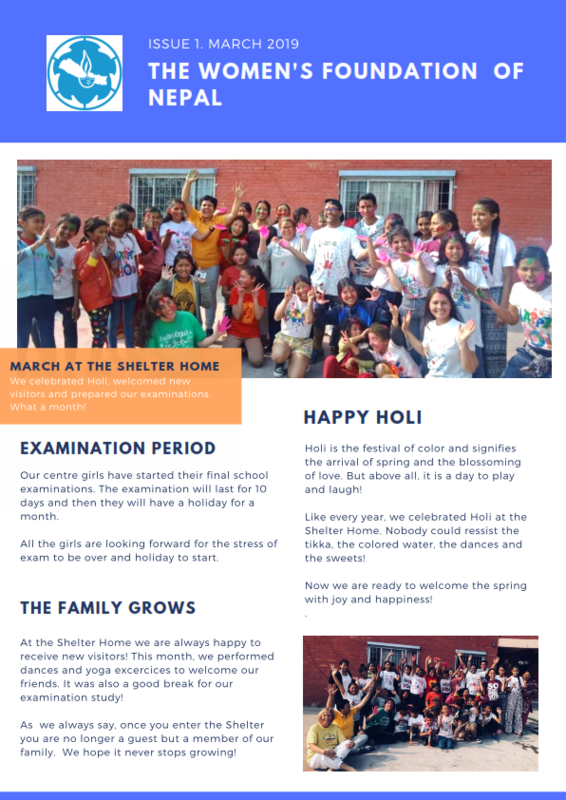 Geeta, Riju, Samjhana, Swostika, Prazu, Prakriti and Dilara; You have made us proud! Basant Panchami, is a hindu spring festival.It is observed on the fifth day of the Indian traditional calendar month of Magha, which typically falls in the Gregorian months of January or February. 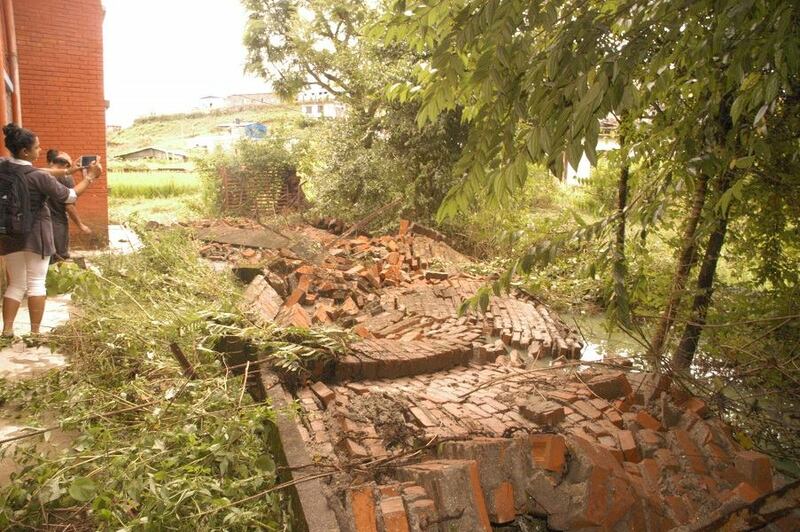 Devastating Earthquake 2015 had massively damaged the fenced brick walls of the WFN’s Shelter Home at Thali, Kathmandu. Due to the mentioned problem, WFN Shelter women and children have been facing the risk of material theft and insecurity. Furthermore, the rain water flows and leaks inside the building, has created another problem. A consequently, yesterday heavy rainfall has completely destroyed the erected walls and we are really worried about the security of our Shelter Family members. 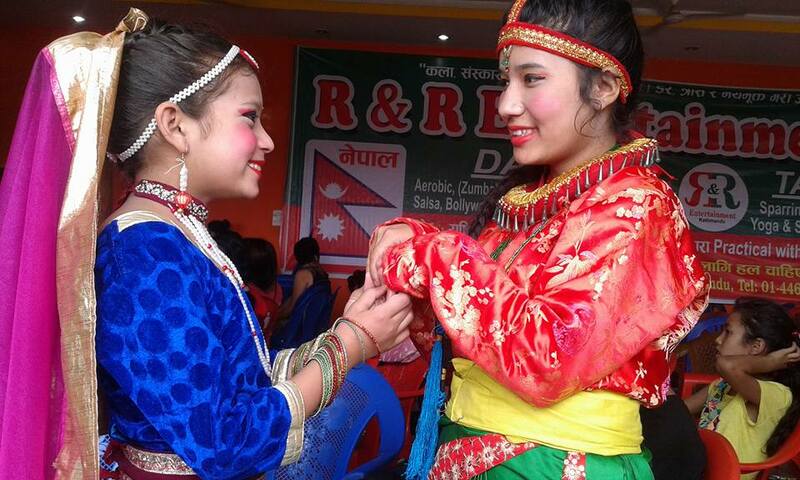 WOMEN’S FOUNDATION NEPAL proudly announce that our 5 particpated children got successfully selected for the semi final in dance competation organised by R&R rhythm entertainment named‪#‎Stage_of_school_dance‬. Thank you very much for all of your support. This would not possible without your uncondtional love and support. Your vote became their strength to be in this position. They need your support to win upcoming semi finale to reach to finale. We want our children to win the crown. Keep supporting our children.